Will U.S. Bancorp Increase Its Dividend? Last week, the Federal Reserve released the first part of the annual banking stress tests results, which examined the impact of a severe economic downturn on the largest U.S. banks. While it stood out as one of the strongest banks during last year's stress tests, U.S. Bancorp again posted especially encouraging results. The results highlighted the strength and sustainability of U.S. Bancorp's balance sheet and profit engine. 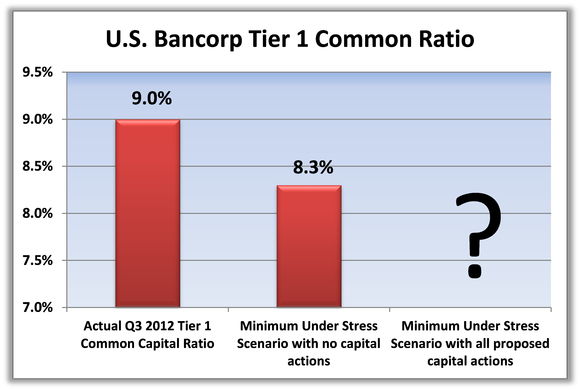 In addition to posting a higher actual Tier 1 common ratio in Q3 in 2012 compared to 2011, U.S. Bancorp posted an impressive minimum Tier 1 common ratio of 8.3% under the severely adverse scenario. During the previous year's tests, USB's minimum Tier 1 common in the doom-and-gloom scenario was 7.7% without the proposed 56% dividend increase included. This year's test assumes that elevated dividend remains constant through the nine-quarter stress period, making the 8.3% ratio that much more impressive. Regardless of some investors clamoring about the ease of the tests this year, it is hard to deny the improvements U.S. Bancorp has made to its balance sheet and business prospects. Should US Bancorp request another bump? Last year, U.S. Bancorp asked and received approval for a 56% increase in quarterly dividend payment. Additionally, the Fed did not reject the company's proposal for a new 100 million share repurchase program. USB ultimately repurchased 59 million shares of common stock in 2012 for roughly $1.9 billion, around $500 million more than it returned in the form of common stock dividends. Given the substantial improvement of its balance sheet under a stressed scenario, U.S. Bancorp seems to have ample leverage in negotiating any additional actions to return more cash to shareholders. While it seems U.S. Bancorp is strong enough to request a substantial increase in its dividend, I believe investors may want to temper their expectations. The Fed has explicitly said that dividend payout ratios above 30% will receive "particularly close scrutiny." U.S. Bancorp's dividend payout ratio has hovered around the 30% level for the last three quarters. If the Fed and the bank cannot agree on a substantial dividend increase, U.S. Bancorp may request to ramp up share repurchases. Therefore, I expect USB to ask and receive approval for a slight dividend increase, as well as a share buyback program. With big finance firms still trading at deep discounts to their historic norms, investors everywhere are wondering if this is the new normal, or if finance stocks are a screaming buy today. The answer depends on the company, so to help figure out whether U.S. Bancorp is a buy today, I invite you to read our premium research report on the company today. Click here now for instant access! The article Will U.S. Bancorp Increase Its Dividend? originally appeared on Fool.com.